Ulaanbaatar means ‘red hero’ in Mongolian, but the grandiose roots of this name today are lost, as the city has come to be associated with dystopian levels of air pollution—especially in the wintertime, when the temperature drops to minus 40 degrees (Celsius and Fahrenheit converge when it is this cold). In almost every account, the culprit for Ulaanbaatar’s devastating pollution is the ger districts—areas not connected to municipal infrastructure, where people mainly rely on burning low-grade coal to keep warm during the harsh winter. With the surrounding mountains and river trapping the smoke coming from the fires of its poorest inhabitants, a city once considered a ‘showcase of socialist progress’ is now depicted as in ‘crisis’ with no foreseeable solution. This state of affairs has been epitomised in the popular social media hashtag #Prayforulaanbaatar. The dominant register when discussing Ulaanbaatar is crisis. At a press conference (Boldsukh 2017) on 11 January 2017, Mongolia’s then president, T.S. Elbegdorj sounded a controversial warning: ‘The pollution has reached a level where it has caused stillbirths. If this is not disastrous then what is? It has become dangerous to live in Ulaanbaatar. Ulaanbaatar has become a futile city with no future.’ Many local residents echo this sentiment of uncertainty, a sentiment exacerbated by increasing distrust in the promises of politicians, which in turn is starting to erode faith in Mongolia’s democratic institutions. Protesting the air pollution, Mongolians have marched on Suhkbaatar Square in the heart of Ulaanbaatar chanting the slogan ‘we are suffocating’ (booj ukhlee), which as Chisato Fukuda points out also means ‘we are extremely frustrated’ (Fukuda 2017). When I was in Ulaanbaatar in January 2017, protesters placed facemasks on several of the city’s statues, including those of the socialist leader Tsedenbal (1954–84) and Mongolia’s hallowed democracy activist Sanjaasurengiin Zorig, who was stabbed to death in 1998. 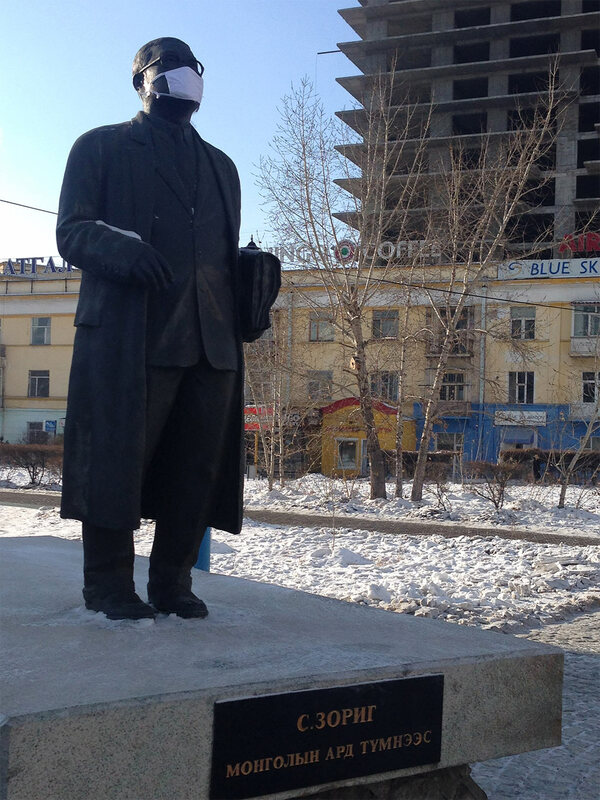 Perhaps only the statue of Lenin, which was moved in 2012 from downtown Ulaanbaatar to the courtyard of a four-star hotel in Terelj National Park, can still breath fresh air. S. Zorig also known as the ‘Golden Swallow of Democracy’—Statue with Facemask. As Ulaanbaatar’s future is shrouded in smoke, many older residents wistfully recall a different city. In the words of a friend who grew up there during the final decade of socialism: ‘My Ulaanbaatar where I grew up and played no longer exists.’ She is not alone in this sense of loss. Several Facebook pages are devoted to posting old photographs of socialist-era Ulaanbaatar with its clean streets, modern buildings, parks, and open spaces. The problem with such urban aesthetic reverie is that it is disconnected from the political and economic conditions of urbanisation. Socialist Ulaanbaatar was constructed out of an ideological vision grounded in different conceptions about public space and community. 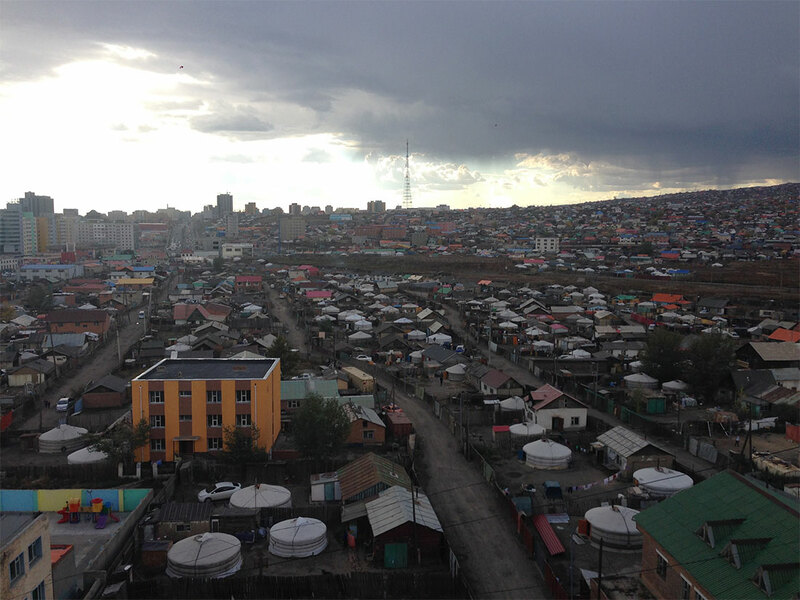 But people’s nostalgia for Ulaanbaatar as a space seldom translates into openly expressed longing for socialism. 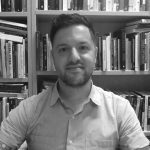 There is no discursive space to ask: were Ulaanbaatar and Mongolia better off under socialism? Foreign media depicts Ulaanbaatar’s air pollution as a catastrophe disconnected from political and historical context, while domestic discourse focuses on finding practical and technological solutions to the air pollution crisis. The collapse of socialist political infrastructure resulted in the dissolution of herding collectives, migration flows from the grasslands to the capital, and privatisation of land driving the expansion of ger districts. However, the context of democratisation and land privatisation are ignored in favour of a narrative that isolates and blames the ger districts as the cause of Ulaanbaatar’s lack of a future. From this perspective, the possibility that positive aspects of socialism were lost in the transition to democracy cannot be considered. Mongolia’s status as an ‘oasis of democracy’ is guarded against critical scrutiny in a way that forecloses the imagination of new political possibilities. The discourse of democracy poses an obstacle to a future whose contours may not be visible, but whose necessity can be felt in the unbearable contradictions of the present. Is it possible to act on the recognition that there may not be much that is democratic about democratic institutions under capitalism? As Slavoj Žižek (2009) has argued, free elections may counterintuitively render a government ‘more impervious to criticism by [social] movements’ in that leaders can respond to protestors: ‘Who are you to criticise us? We are an elected government, we can do what we want!’ This is not to argue for the abolition of elections but for the democratisation of political and economic life. The temporalities of utopia and dystopia converge in the satellite city of Nalaikh, about 35 kilometres outside of Ulaanbaatar. The Nalaikh state mine opened in 1922 and ran for almost the entirety of the socialist era until 1990, when it closed down because of a fatal methane gas explosion and the disappearance of Soviet subsidies. 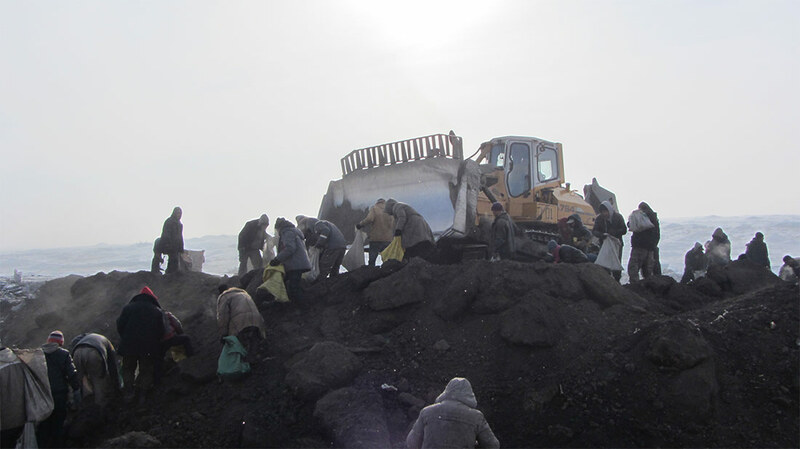 When I visited Nalaikh in January 2017, local residents were scavenging coal from slag heaps on the outskirts of the city (see Figure three), their survival depending on the use and sale of the remaining coal deposits. 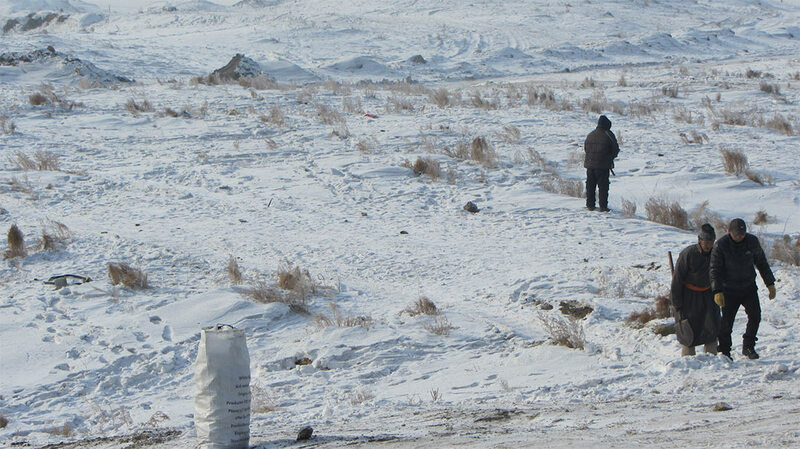 The coal from Nalaikh ends up in Ulaanbaatar’s ger districts, where its combustion provides winter heat at the cost of the future. 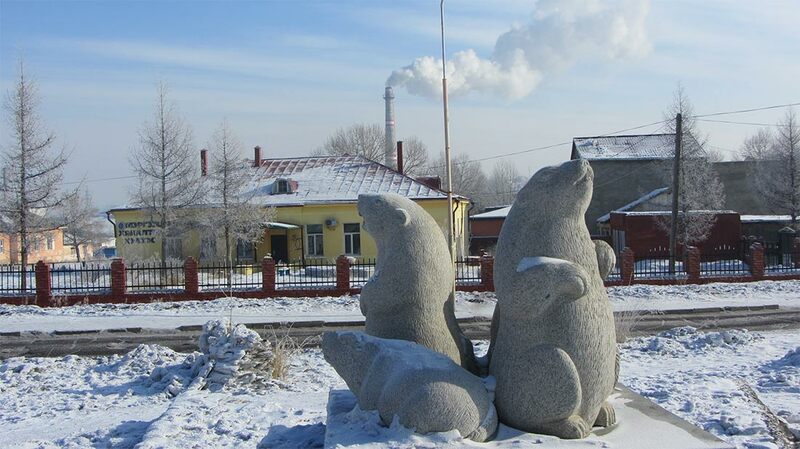 In the midst of Nalaikh’s abandoned socialist past and precarious present is a small monument commemorating the disappearance of a local species of marmot. They stand alert in anticipation of their extinction. By contrast, the bodies on the slag heaps appear entirely consumed in the strenuous labour of survival. Both images pose questions. Is there a future beyond immediate survival? For what purpose is labour expended? They are uncomfortable questions because we lack convincing answers to them. But just because our political vocabularies are damaged and less able to inspire confidence does not mean that Ulaanbaatar’s future should be abandoned to the impasse of the present. Boldsukh, Chintushig. 2017. “Vice Speaker calls for the impeachment of the President.” The UB Post, 13 January. http://theubpost.mn/2017/01/13/vice-speaker-calls-for-the-impeachment-of-the-president. Fukuda, Chisato. 2017. 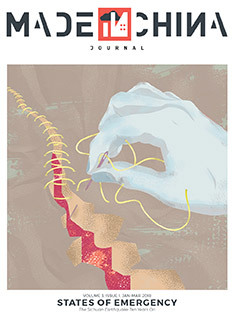 ‘A Fight to Breathe.’ Medical Anthropology Quarterly, 29 March. http://medanthroquarterly.org/2017/03/29/a-fight-to-breathe. Žižek, Slavoj. 2009. In Defense of Lost Causes. London: Verso.